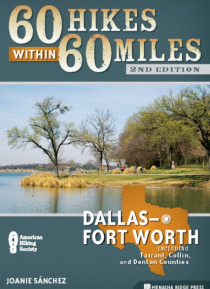 60 Hikes within 60 Miles: Dallas / Fort Worth covers the best trails the metroplex has to offer, including popular trails as well as lesser-known paths no guidebook has covered before. This is the essential guide you'll need for hiking in the Dallas / Fort Worth Metroplex. Choose a trek alongside ancient dinosaur tracks at Dinosaur Valley State Park, or follow fresh prints of live coyote and white… -tailed deer at Lake Mineral Wells. Explore remnants of Texas' disappearing blackland prairie, or wander amongst the dense hardwood forests of the riparian wetlands. A hike for every mood, you can pick a quiet hike to a secluded pecan grove or an upbeat populated hike to a State Champion Oak Tree -- or maybe you just want to feel like a pioneer as you hike through the wilderness of the LBJ National Grasslands. Hikes include treks through open prairies, rolling hillsides, lakeside beaches, and other treasures all found just a daytrip or less from the Dallas / Fort Worth Metroplex.